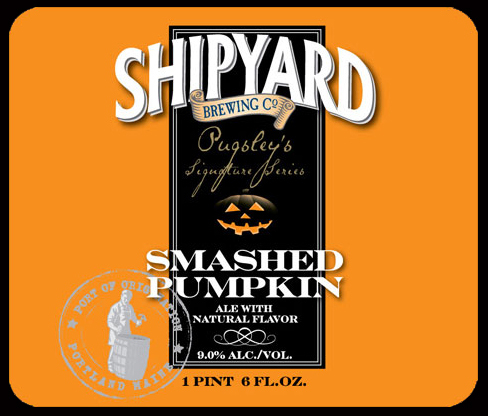 Part of Shipyard’s “Pugsley’s Signature Series”, Smashed Pumpkin is an autumn seasonal comes a 9% ABV. 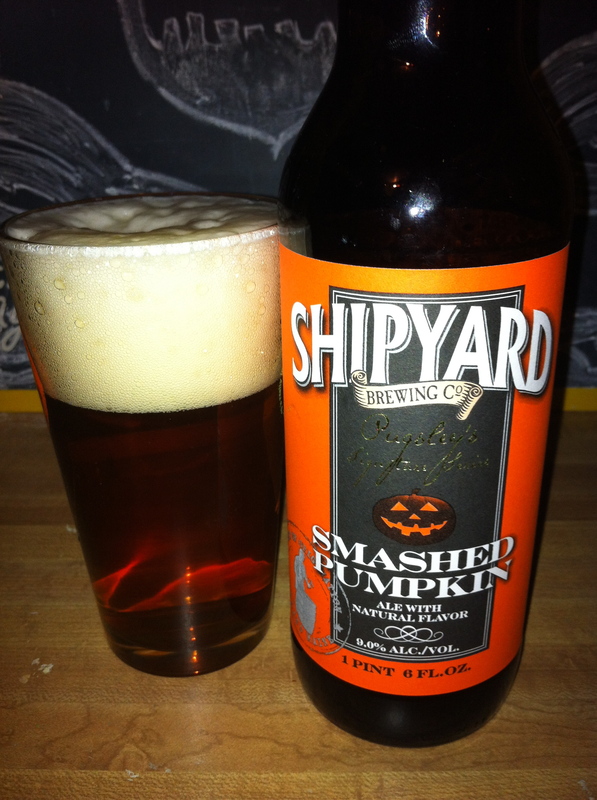 Smashed Pumpkin is a big-bodied beer with a light coppery orange color and pleasing aromas of pumpkin and nutmeg. The Pale Ale, Wheat and Light Munich malts combine with the natural tannin in pumpkin and the delicate spiciness of hops to balance the sweetness of fruit. Smashed Pumpkin pour a light caramel color with flecks of gold. Head is a bubbly two inches of manilla and leaves behind a teensy bit of lacing. The nose starts with pumpkin and gingerbread before giving way to a cherry sweetness. Cherry floods through your nostrils and quickly becomes the dominate scent. It appears again in the flavor, with cherry and brown sugar coming first. I was reminded of a Hostess cherry pie as I took my first few sips of this beer. Pumpkin spice is present, but it is overshadowed by the fruity sweetness. As it warms up pumpkin and vanilla start to come through more and balance things out. Mouthfeel is medium going on medium-thick. There was a surprising amount of stickiness from this beer, which is odd for a pumpkin ale. I was expecting more pumpkin than I got with this beer, but that didn’t stop me from being impressed by its uniqueness. Smashed Pumpkin isn’t the best representation of a pumpkin ale, it is, however, one of the more original pumpkin beers readily available on the market.